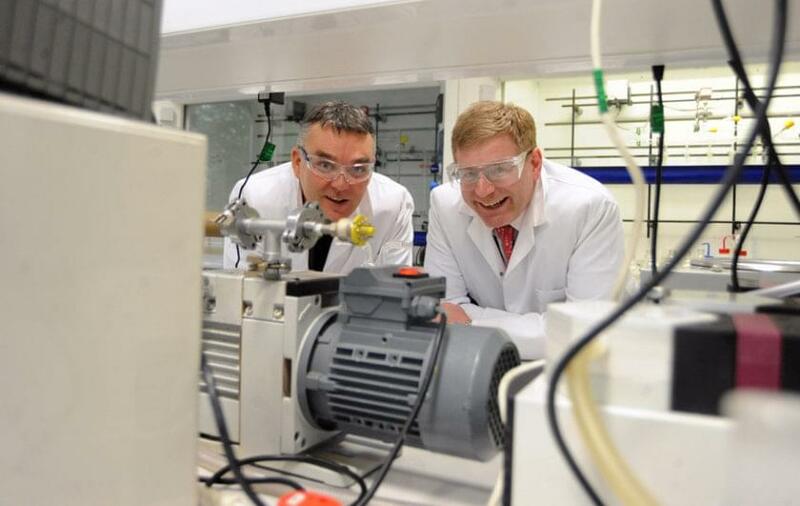 Pictured (left to right): David Haddleton of Warwick Effect Polymers with David Grindrod, deputy director of the University of Warwick Science Park. A Coventry company that designs and develops specialist molecule-based solutions is combining with a leading London-based biopharmaceutical firm to provide ‘best-in-class’ technology. The deal sees Warwick Effect Polymers (WEP) join forces with PolyTherics, a major provider to biopharmaceutical companies, which works towards the improvement of protein and peptide-based drugs. WEP has developed two pieces of technology, PolyPeg and GlycoPol, based on the leading academic work of Professor David Haddleton of the University of Warwick. The Living Radical Polymerisation solutions have the ability to target and deliver bespoke, tailored therapies to treat a variety of illnesses, including those associated with the autoimmune system, such as Alzheimer’s, Huntington’s and Parkinson’s. PolyPeg and GlycoPol have been developed as protein and peptial solutions, to work with drugs that improve the stability, safety and effectiveness of treatments. Another advantage is that drugs have longer ‘in-body’ duration, improving patient care, and reducing the frequency requirement of injections. The deal will see WEP move its operation to a new unit at the Vanguard Centre at the University of Warwick Science Park in Sir William Lyons Road. The move will enable the development of more advanced biopharmaceuticals and support the business in its planned expansion strategy. Dave Haddleton from WEP believes the link up between the two companies will see exciting results. David Grindrod, deputy director of the University of Warwick Science Park, said WEP was a model tenant company.